CHARLOTTE – The Carolina Panthers‘ dream season came to an abrupt end Sunday, as the San Francisco 49ers defeated the NFC’s second seed, 23-10, at Bank of America Stadium. Squandered opportunities by Carolina (could have led 28-6), set up the loss. The game was a defensive struggle, as expected. 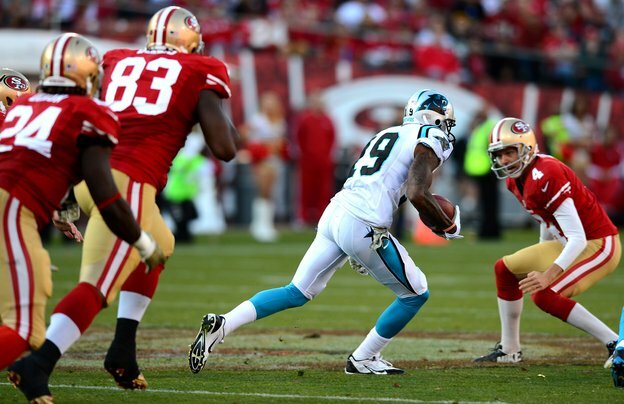 Carolina fell behind 6-0 following two field goals by the Niners Phil Dawson. But Cam Newton, who played exceedingly well in the first half, found his stride, and his receivers in the second quarter. His best pass was a 31-yard touchdown throw to wide receiver Steve Smith, which gave the Panthers a 7-6 lead early in the quarter. Ten minutes later, Carolina’s Graham Gano hit a 24-yard field goal as Riverboat Ron Rivera, stung from earlier missing a fourth-and-one from the half-yard line opportunity, chose to get the easy three points, giving Carolina a 10-6 lead. 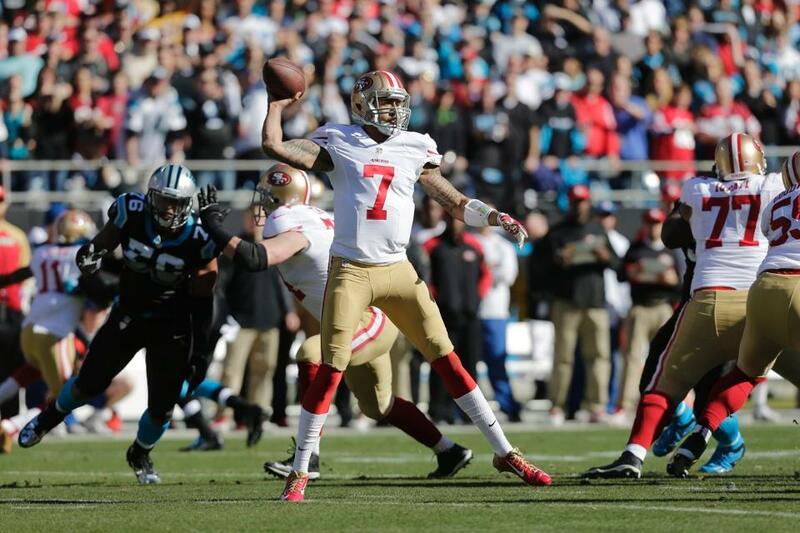 San Francisco QB Colin Kaepernick led the Niners to a 23-10 win at Carolina. Just when you thought the Panthers might have had the Niners number, Colin Kaepernick became Superman (more on that later). He led the visitors on a 12-play, 80-yard drive that consumed 3:36. His one-yard touchdown toss to Vernon Davis in the back corner of the end zone and subsequent PAT gave the Niners a 13-10 halftime lead. 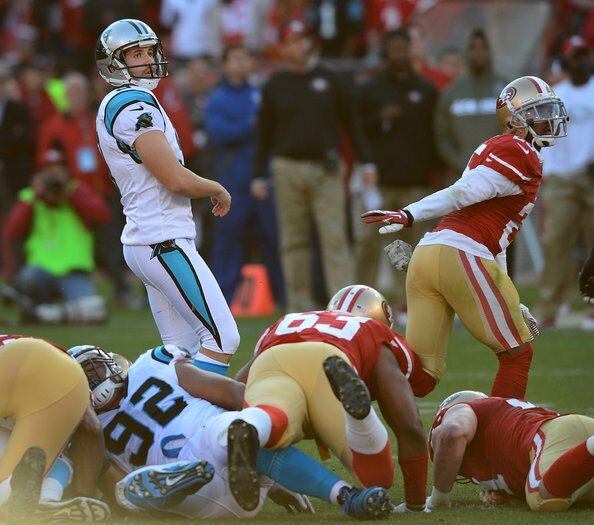 It was the first touchdown scored by San Francisco in 18 drives against the Panthers this season. And to make things worse for the home team, the Niners defense stuffed the Panthers on their opening drive of the second half – three-and-out – keeping all the momentum with the NFC’s No. 5 seed. Then, Kaepernick was at it again. He led the Niners down the field on an 8-play, 77-yard drive in 4:32, culminating with Kap’s 4-yard rush into the end zone. After not scoring a touchdown on 17 drives against Carolina this season, suddenly, the Niners had two in a row. And, to make things interesting, Kaepernick celebrated by copying Cam Newton’s nearly-patented Superman celebration pose, before kissing his bicep, which, of course, is Kap’s celebratory move. 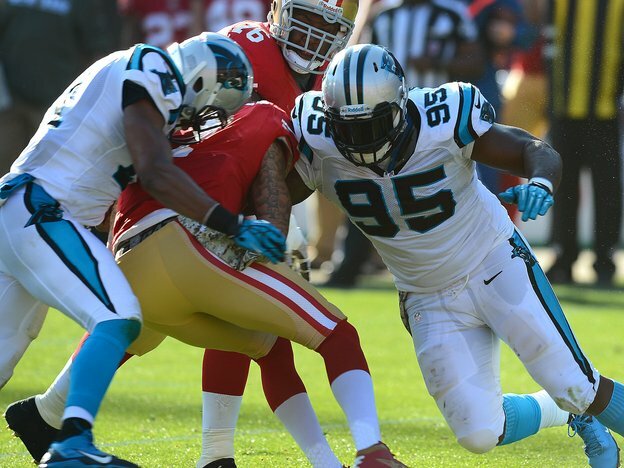 In the second half, the Niners defense stifled Newton and the offensive line for Carolina was unable to hold off the mostly four-man rush. Newton was sacked time and time again, as he was unable to find open receivers. With 4:30 to play in the game, Carolina’s chances ended when Newton threw his first interception of the game to Dante Whitner. With the Niners leading 23-10, a touchdown was about the only hope the Cats had to come back in the game. No need to cry about this one…the Panthers had their chances early, but the better team won today. The team with playoff experience won the game. The team that was able to make crucial stops on their own goal line (twice) early in the game, won it. The team that failed to intercept a pass thrown right in their breadbasket, nine yards away from their end zone, and a near-sure pick-six, lost. Here’s what happened to the Panthers early in the game: First, on the half-yard line, a fourth down try for the touchdown failed as the Niners stuffed Newton on a sneak. The second was when cornerback Quentin Mikell dropped a potential nine-yard pick-six from Colin Kaepernick. Really, I could have run that in (if I had caught it). Then, probably because of the first failure to score from the half-yard line, facing a similar situation, Riverboat Ron went for the sure three points, as Gano made field goal. Think about it…21 potential points became just 3. If the field was 99 yards long, this would have been a different game, but, of course, it is not. 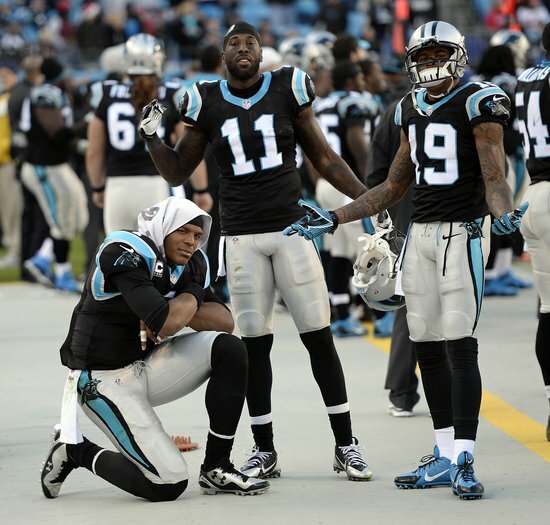 The Panthers had an excellent season, winning the NFC South and winning 12 regular-season games. They are in fine shape to post back-to-back winning seasons for the first time in 2014. This one will sting, but it shouldn’t take away from what was overall a much better season than almost everyone expected. 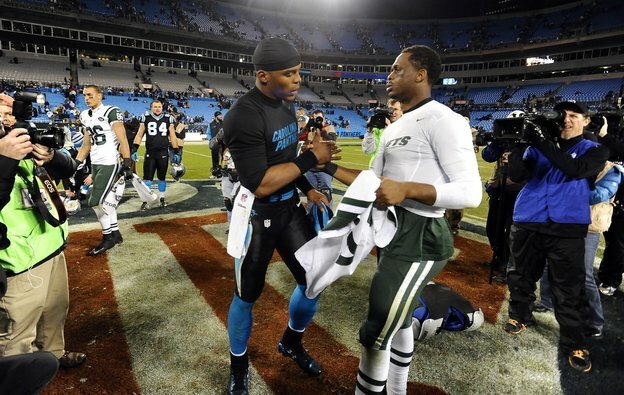 Two of the best young quarterbacks in the game meet before today’s contest. 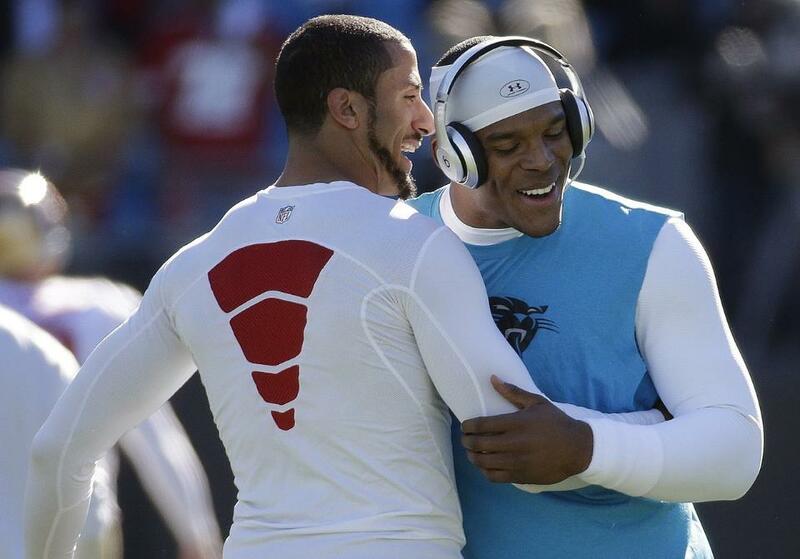 San Francisco’s Colin Kaepernick (left) and Carolina’s Cam Newton. This year, the Panthers helped me get a few bucket list items marked off. As a member of the working press, I was treated as an equal during the entire season, from July through today. They gave me full media credentials and access to the players and coaching staff. I was on the sidelines during practice, at times close enough so that I believe I could have made a couple of plays (not really…). 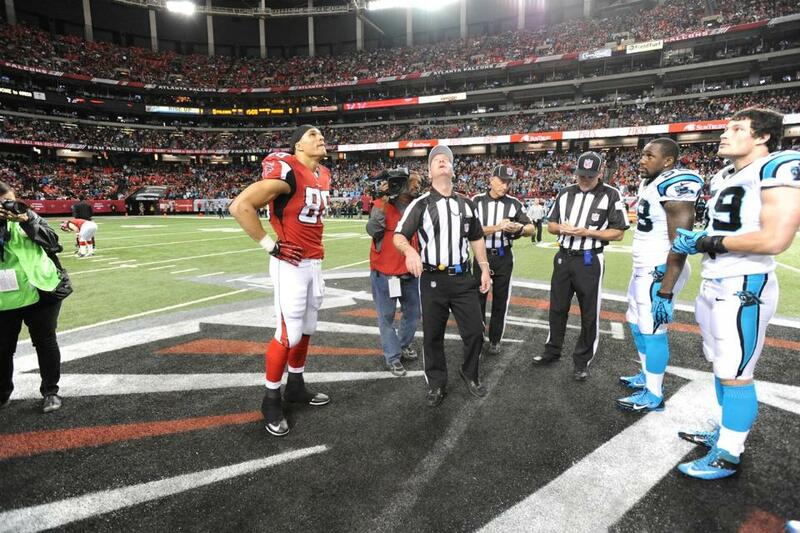 I attended games at Bank of America Stadium and was treated with respect by staff and media peers. And to have been able to cover this team from the opening of training camp (when I said I felt they would win 10 games) until today. It was quite a ride. I hope you, my readers, have enjoyed some of my insights this season. MIAMI – “Seven! Seven wins in a row for the Carolina Panthers! MWA! HA! HA!” (Count Von Count on the Panthers). The Panthers (8-3) are on a roll and have tied their franchise regular-season win streak (with the 1996 team) at seven games following another close win – this time at Miami (5-6). Quarterback Cam Newton led the black-clad visitors down the field on an 80-yard drive as time was running out, and the Panthers came away with a 20-16 victory. It was his second signature drive in seven days after having none in his first 41 games. Carolina Panthers head coach Ron Rivera was not pleased with the team’s effort in the first half of the game at Miami. The Panthers went into halftime trailing 16-6, and it could have been worse. Head coach Ron Rivera was furious at halftime because he felt, in his words, that the Panthers had “disrespected” the Dolphins by not playing hard enough. When the team came back onto the field at Sun Life Stadium, it was a different bunch of guys. Focused, physical and determined. Yet it took another gamble by “Riverboat Ron” to put the Cats in position to win the game. Facing a fourth-and-10 at their own 20 with 2:33 left on the clock, the Panthers trailed Miami 16-13. 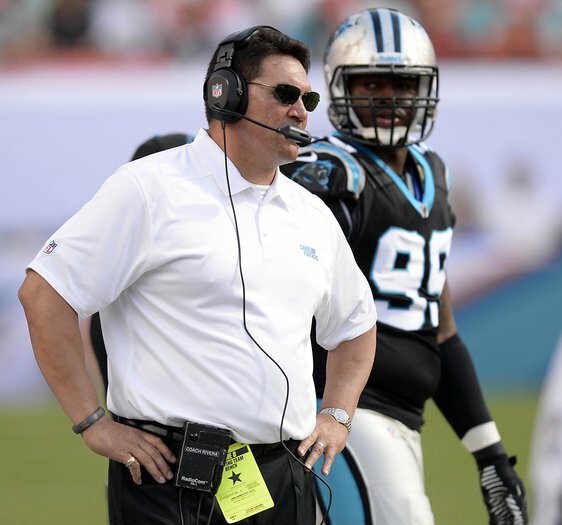 Rivera, who said he prefers “Calculated Risk-Taker” to “Riverboat Ron,” played the odds. According to an advanced NFL statistics website’s win-probability calculator, the Panthers had a 14 percent chance of winning before the fourth-down snap. Had Carolina punted, and using the average Brad Nortman punt from Sunday, the Dolphins would have gotten the ball back with an 88 percent chance to win, and the Panthers would be left with one timeout and the 2-minute warning. A 19-yard completion to Smith got the Panthers a first down, and a 9-yard pass to tight end Greg Olsen got them near midfield at the 2-minute warning. Carolina Panthers tight end Greg Olsen caught Cam Newton’s one-yard touchdown pass to give the Panthers a 20-16 win in Miami. Driving down the field while working the clock down, Newton found tight end Greg Olsen open on a 1-yard touchdown pass with 43 seconds left. The touchdown gave the Panthers their first lead of the game, as well as the victory in front of a crowd of 60,156 and a lot of empty orange seats at Sun Life Stadium. The game did not really feature the back-and-forth scoring as in last week against New England…yet it did come down to the opponent trying to score a last-second touchdown via the pass to take the victory from the Panthers. This time, there would be no controversial ending. Instead, second-year Miami quarterback Ryan Tannehill threw a Hail Mary pass to the one-yard line, hoping receiver Mike Wallace would come up with the miracle catch. He almost did. 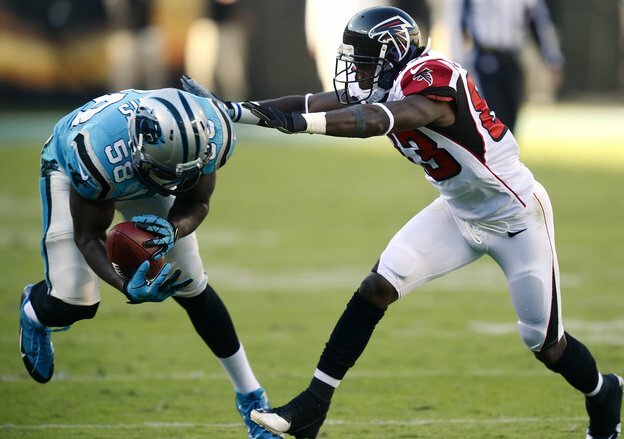 Wallace was a thorn in the side of the Panthers defensive backs, who collectively had a horrible day. On the game’s final play, Panthers free safety Mike Mitchell somehow let Wallace get behind him near the goal line, but this time Wallace was unable to make the catch and the game ended. Tannehill completed 28 of 42 passes for 310 yards – the first time the Panthers allowed a 300-yard passer since Seattle’s Russell Wilson threw for 320 in Week 1. A third of Tannehill’s yardage came on two completions to Wallace, the $60 million free agent acquisition who had not been the deep threat Miami envisioned through the first 10 games. But Wallace found his way against Panthers cornerback Captain Munnerlyn, beating his twice for receptions of 53 and 57 yards. The game was the third fourth-quarter comeback win in a row for the Panthers, who now will get ready to play a revitalized Tampa Bay squad Sunday in Charlotte. Week 14 game at New Orleans has been moved to an 8:30 p.m. start on Dec. 8 at the Superdome. The game was originally scheduled to kick off at 1 p.m. 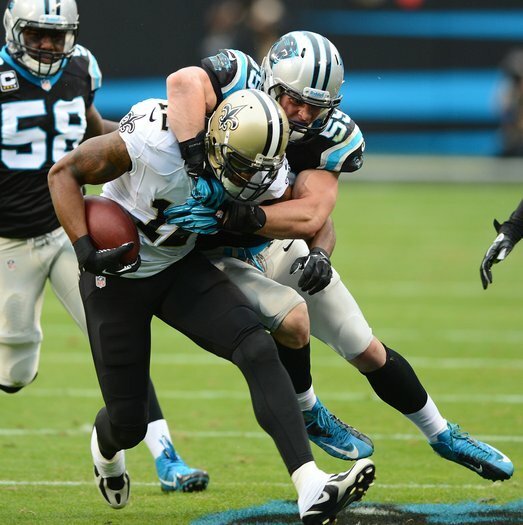 The Panthers (8-3) remain a game behind the Saints (9-2) in the NFC South by virtue of their win at Miami on Sunday. 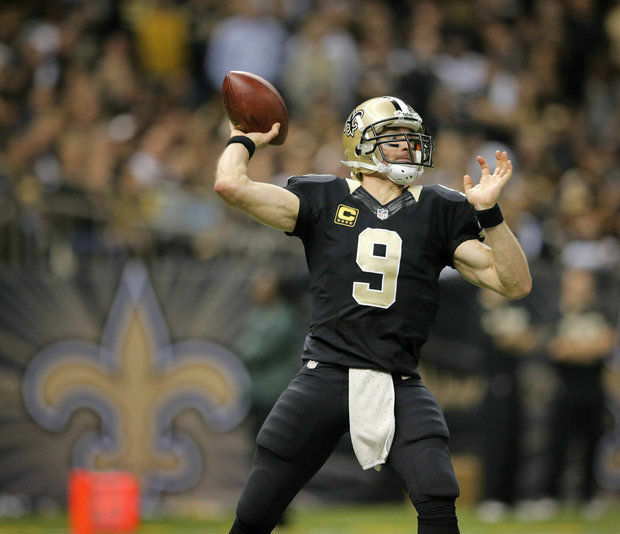 The Saints beat Atlanta on Thursday night. Carolina and New Orleans will play twice in a 15-day span in December, in games that likely will determine the division winner. 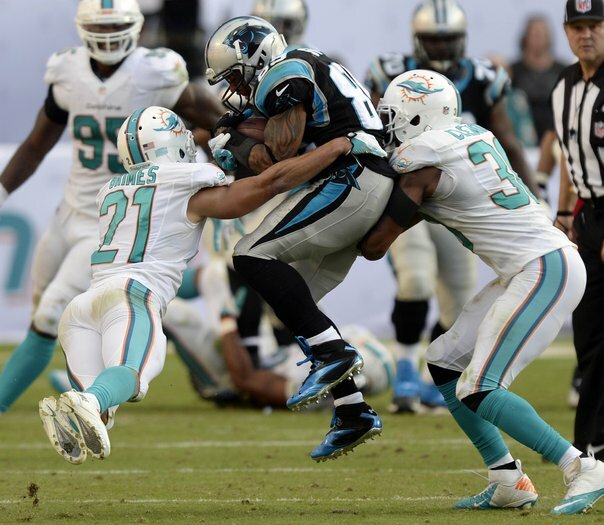 Carolina Panthers wideout Steve Smith makes a reception on 4th down late in the game as Miami Dolphins defenders Brent Grimes (21) and Chris Clemons (30) try to take him down. 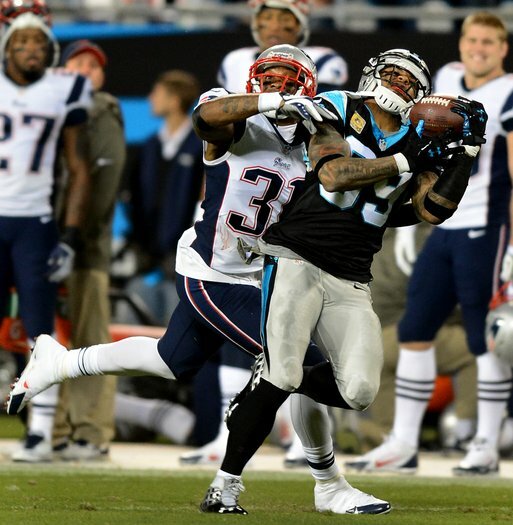 CHARLOTTE – The Monday Night Football stage was not too large for the Carolina Panthers who won a thrilling – and controversial – game against the New England Patriots 24-20. In the Panthers biggest game since a 2008 playoff loss, 74,000 fans, most of whom wore black to match the Panthers uniforms, rocked Bank of America Stadium from before kickoff until the final play. Panthers (7-3) quarterback Cam Newton drove the team 83 yards on 13 plays for the go-ahead touchdown, yet the Pats (7-3) still had a chance to win the game. Patriots (7-3) quarterback Tom Brady led his team to the Carolina 18 with 3 seconds left and threw a pass into the end zone as time expired. His target, tight end Rob Gronkowski was in the back of the end zone with Panthers linebacker Luke Kuechly draped all over him. The pass fell short and was intercepted by rookie safety Robert Lester, however, an official at the back of the end zone threw a flag for pass interference. Moving quickly, the officials gathered and waved off the flag, ruling Gronkowski could not have caught an underthrown ball. Ever since that call, all the talk shows have been commenting about this. Had the call been upheld, the Patriots would have had the ball at the Panthers one-yard line and would have had another shot at a game-winning touchdown with no time on the clock. If you haven’t seen the play, watch it here. The call culminated a gutsy effort by the Panthers, who have now won six in a row, matching a six-game streak in 2005 for the second-longest in franchise history. The 1996 team won seven-in-a-row. 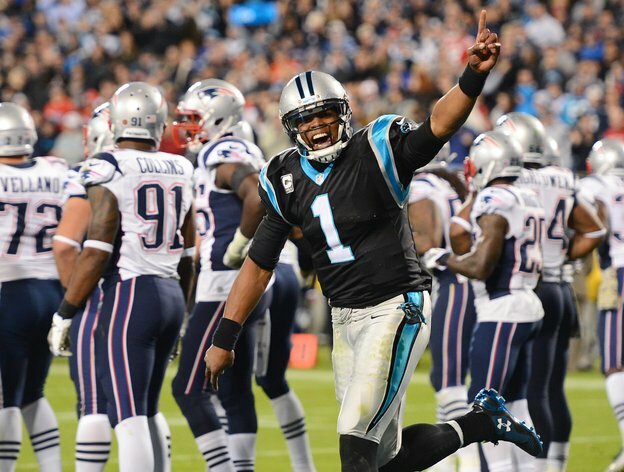 Newton completed 19 of 28 for 209 yards and three touchdowns, with a passer rating of 125.4. He also was the game’s leading rusher with 62 yards on seven carries. Carolina scored on drives of 90, 57, 81 and 83 yards, and Cam Newton was every bit the match of Tom Brady on Monday night in Charlotte. Newton’s 14-yard scramble had a Ray Rice (Baltimore Ravens running back) feel to it. It was borderline unbelievable, certainly the play of the game. During the pre-game portion of ESPN’s telecast, analyst Jon Gruden said Newton would make a play that would show you his athleticism. I had to smile as the play began to unfold. According to ESPN Stats and Info, Newton covered 75.8 yards and dodged six defenders. The best move, when he had two defenders in front of him, coming at him, was a step-back-Jack backward jump that helped free him. He also was helped by a first-class block up field by fullback Mike Tolbert. He led the Panthers on a 90-yard, nine-play drive to begin the scoring, with wideout Steve Smith making a huge 42-yard catch – a season-long – beating Patriots cornerback Aqib Talib, and starting a long night for the former Tampa Bay corner. Smith and Talib got into two skirmishes on the drive, with Talib getting flagged for 15 yards on one. Leading 7-0 after the first quarter, the Panthers have now gone 14 consecutive games without allowing a first-quarter touchdown. The win keeps the Panthers just one game back of New Orleans (8-2) in the NFC South, and still, if the playoffs began today, the Cats would be the 5 seed. 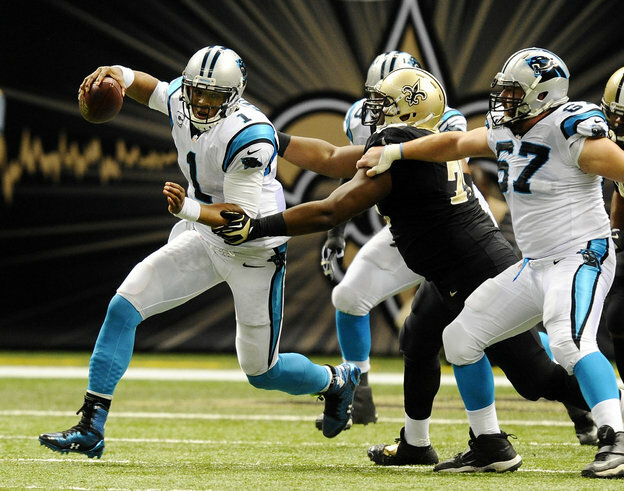 The Panthers and Saints will meet two times in a three-week period in December, which should solidify things. The Panthers face a short week, and a two-hour flight to South Florida for Sunday’s game at feisty Miami, before returning to Charlotte to face Tampa Bay. In the 2013 NFL Digest of Rules, under Article 2 of pass-interference penalties, one of the acts that defines interference is: “a) Contact by a player who is not playing the ball that restricts the opponent’s opportunity to make the catch.” In many analysts’ opinions, Kuechly made contact with Gronkowski while not playing the ball, and it restricted Gronkowski’s opportunity to make the catch. In my opinion, yes, that happened, but since the ball was intercepted, to me, the point is moot. For those of you who enjoy physical, defensive football, your new favorite team is the Carolina Panthers. Going into Sunday’s game in San Francisco (6-3), facing a formidable challenge, the Panthers (6-3) defense was suffocating. They held the 49ers to 9 points and gave up just four yards in the fourth quarter. Oh, and the Carolina offense was good enough to score just enough points, as Graham Gano made up for his first missed try of the season by nailing a 53-yard field goal with 10:05 remaining in the game, to help the Panthers win 10-9. The game was a throwback, which was perfect, considering this is the last season the Niners will play in Candlestick Park before moving to their new luxury stadium in Santa Clara. The old-timers would have loved this knock-down, drag-out fight…and that’s what it was. The Niners could do very little on offense. They managed three field goals before the Panthers could get on the board just before the end of the first half. 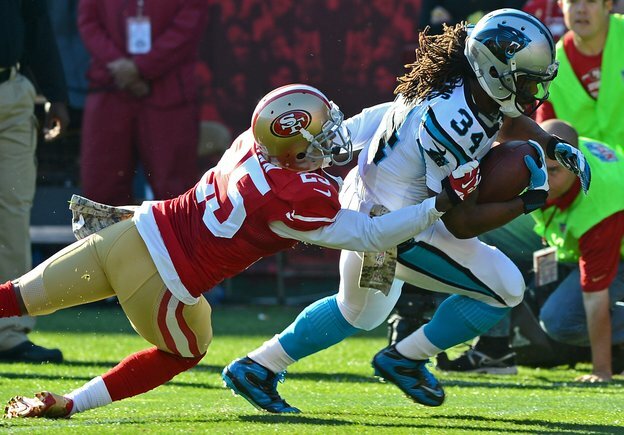 Carolina Panthers running back DeAngelo Williams (34) scored the game’s only touchdown at San Francisco. Trailing 9-0 late in the second quarter, Panthers running back DeAngelo Williams scored the game’s only touchdown on a vintage cutback run, bouncing off one tackler for a 27-yard touchdown. In a game where yards and points were at a premium, Williams not only scored the lone touchdown of the game, but that play was the only one that went over 20 yards from the line of scrimmage for either team. 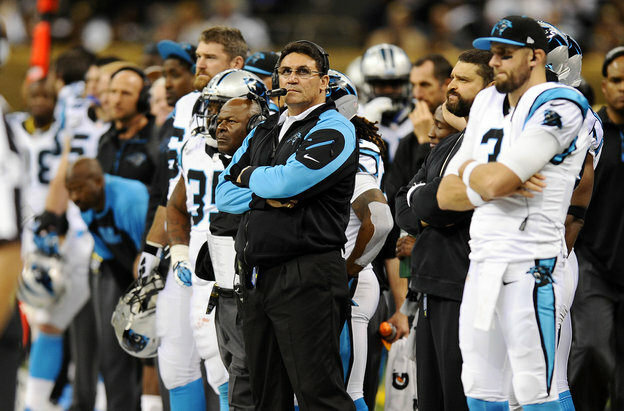 The game represents the biggest win in head coach Ron Rivera’s three years. Earlier this season, the coach was concerned about the Panthers being relevant…now, he wants them to stay relevant. The Panthers offense was sloppy in the first half of the game, losing two turnovers and dropping an interception, but it was the defense that starred on Sunday. Facing a very potent 49ers quarterback (Colin Kaepernick) and one of the league’s top running backs (Frank Gore), the defense did not allow a touchdown to be scored, forcing the Niners to settle for three field goals. Ted Ginn, Jr., whom the Panthers picked up from the 49ers this season, wanted to make his presence known. He did that. Ginn caught two passes for 19 yards, and returned three punts for 65 yards. His statement catch was a third down conversion in the fourth quarter – an 11-yard pass from Cam Newton at the San Francisco 49 for a first down. He dragged his back foot while his motion sent him slowly out of bounds. He stood there at the San Francisco sideline, staring at 49ers safety Bubba Ventrone. 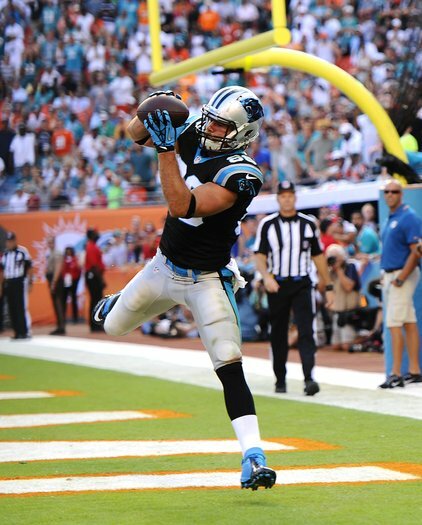 His punt returns included a second-quarter return of 19 yards to the Carolina 43, but the drive stalled. In the fourth quarter, his 25-yard return went to the San Francisco 44. 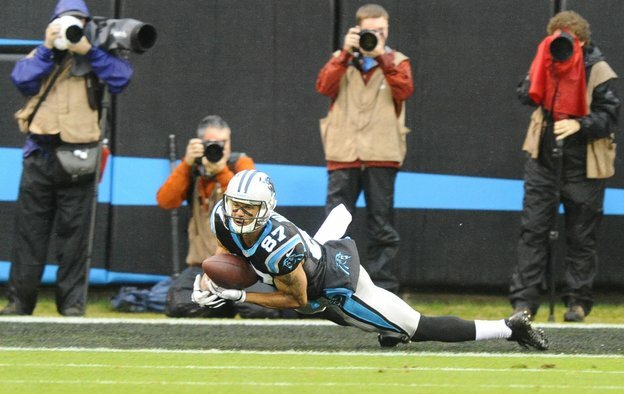 Seven plays later, Carolina had its first lead of the game, on a 53-yard field goal by Gano. Defensively, the key was to stop the 49ers on third down and not let them extend drives. Job well done, Panthers. They held the Niners, who entered the game with a conversion percentage of 40.2, to 15.4 percent on third downs. Not allowing Kaepernick to use his legs to extend plays certainly was a key. The six sacks by the Panthers defense (second-most in a game this season) had to affect Kaepernick’s decision-making. The sensational quarterback was less than that Sunday, as the Panthers held him to just 91 yards passing and grabbed a timely interception to ice the game. Feel good about this one, Panthers, but know you have another tough game coming up Monday night. In prime-time, under the lights…New England (7-2 and coming off a bye) visits Bank of America Stadium in a game that has been sold out for weeks. The Panthers look to avenge some bad losses to the Pats, including a 38-6 loss in 2001 that ended a 1-15 season and, of course, the 32-29 loss in the 2003 Super Bowl. Carolina Panthers cornerback Drayton Florence (29) intercepted this Colin Kaepernick pass late in the fourth quarter to ice the victory for the visitors. Carolina Panthers kicker Graham Gano hit this 53-yard field goal during the fourth quarter that led to a 10-9 Panthers win. Carolina Panthers safety Mike Mitchell (21) and defensive end Charles Johnson (95) combine to make this sack on San Francisco 49ers quarterback Colin Kaepernick. 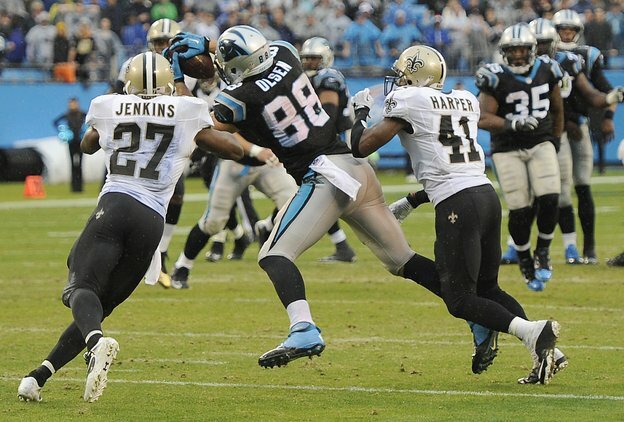 This was one of six sacks recorded by the Panthers defense. 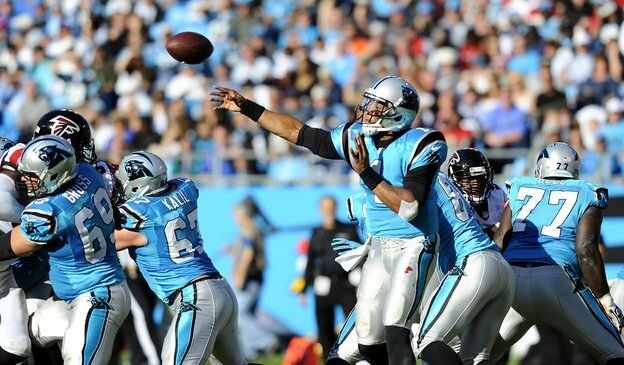 CHARLOTTE – The Carolina Panthers (5-3) did not play their best game of the season, but, as the old saying goes, “Good teams find ways to win games when they play poorly”. The Panthers did exactly that. They found a way to dominate the Atlanta Falcons (2-6), winning 34-10 at Bank of America Stadium. Quarterback Cam Newton was 23-of-37 for 249 yards and did have one touchdown pass, but he also threw two interceptions and was very consistent in his passing…mostly high or overthrown…but the Panthers still found a way to win. The defense put enough pressure on Atlanta’s front four to force Falcons quarterback Matt Ryan into throwing 3 interceptions, including one pick-six by Drayton Florence. 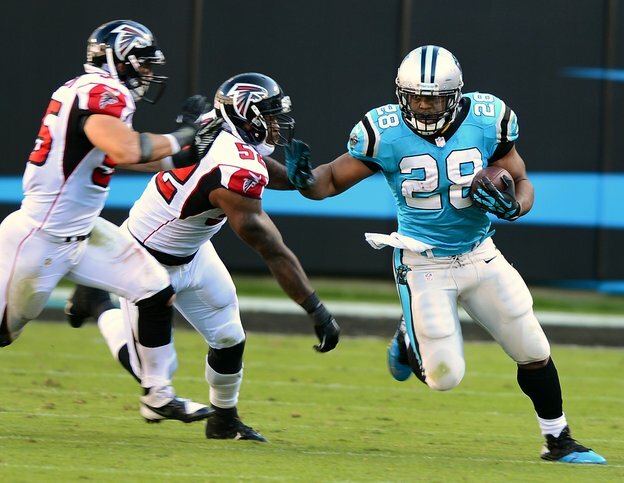 Carolina Panthers running back Jonathan Stewart returned to action after missing nearly a year due to injuries. He ran for a team-high 43 yards Sunday. Jonathan Stewart returned to the Panthers backfield for the first time since last November and led the home team with 43 yards. His backfield partner, DeAngelo Williams was just a yard shy of that total. 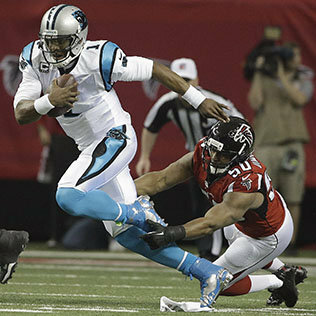 When he found his receivers, Newton picked up chunks of yardage. 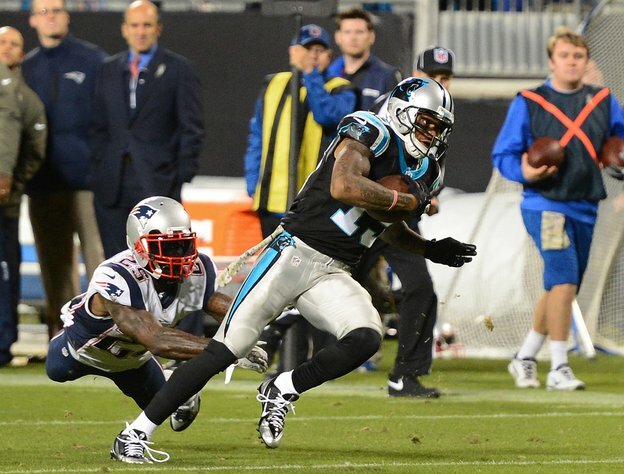 Brandon LaFell led the receiving corps with 6 receptions for 74 yards. 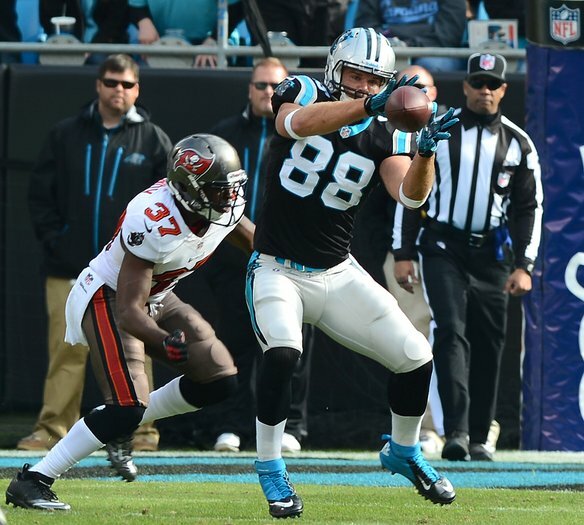 Tight end Greg Olsen caught 4 passes for 66 yards and scored the game’s first touchdown. That reception was Carolina coach Ron Rivera’s first of two fourth-and-one calls of the game and he was rewarded by having Newton find Olsen wide open on a play-action call for a 14 yard touchdown to open the scoring. 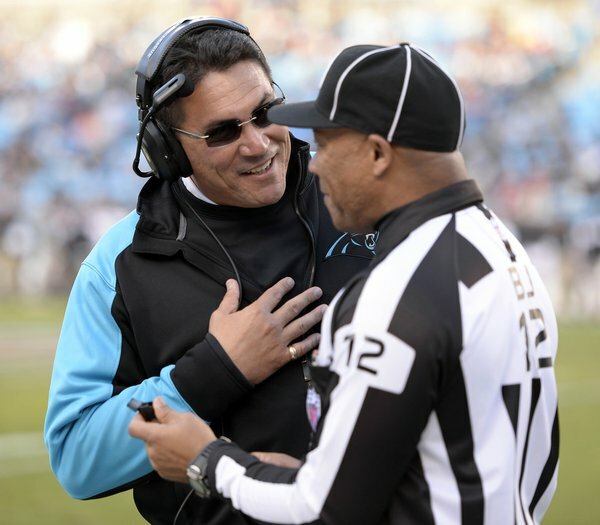 Coach Rivera’s second opportunity, in the last two minutes of the game, was an easier call. 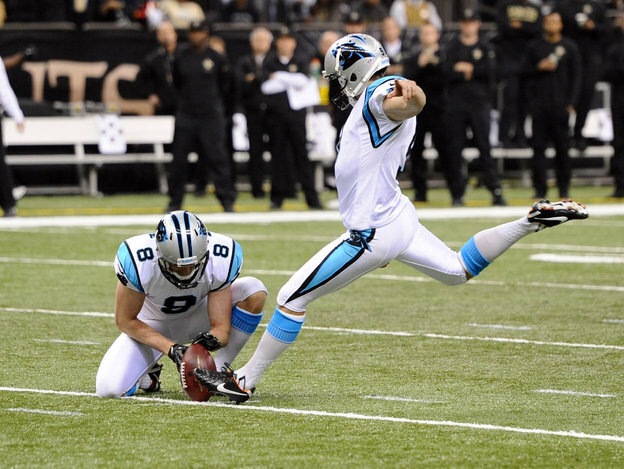 He let Graham Gano come on for an easy 20-yard field goal to ice the game. 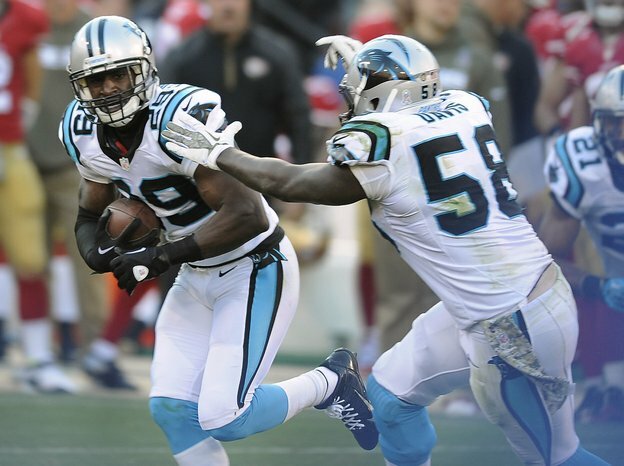 Carolina Panthers linebacker Thomas Davis made the first of three interceptions yesterday for the home team. 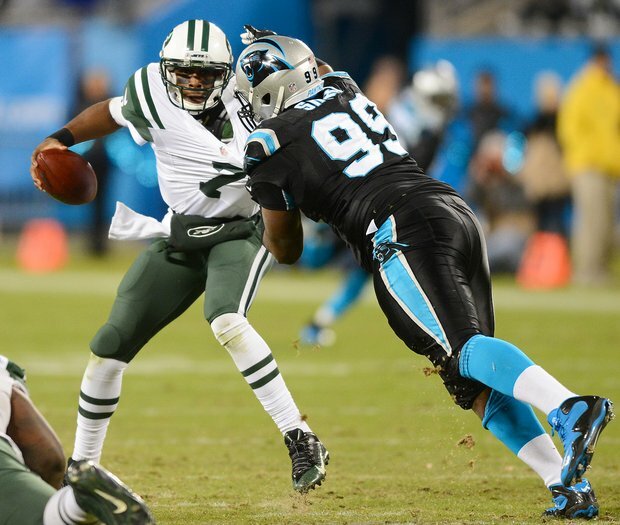 As the league is coming to understand, the Panthers defense is a force to be reckoned with. When you pick off a good quarterback like Matt Ryan three times in a game (linebackers Thomas Davis and Luke Kuechly and cornerback Drayton Florence) including Florence’s 38-yard pick six (on a nice shoe top grab), obviously your front four is putting pressure on the quarterback. And that’s how this team has been built. Big boys up front, agile linebackers and adequate safeties and cornerbacks. Pressure up front has been a trademark of this year’s team. 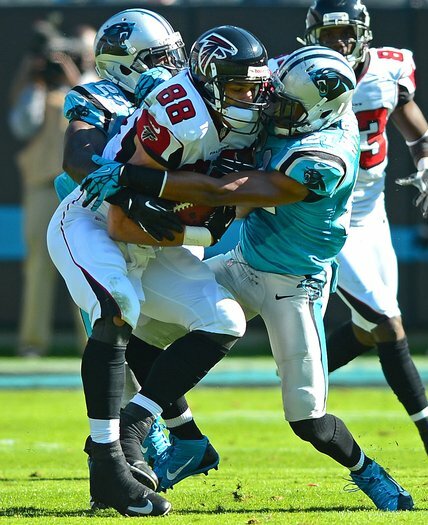 Atlanta Falcons tight end Tony Gonzalez is tackled by Carolina Panthers safety Quintin Mikell (27) and safety Mike Mitchell (21) in Sunday’s 34-10 Panthers win. Atlanta’s future Hall of Fame tight end Tony Gonzalez was a real force in the first half, catching 5 Matt Ryan passes for 77 yards. It seemed like every time Ryan went back to pass, Gonzalez was open. The Panthers defense addressed that situation at halftime, jamming him at the line and holding him to just one reception for four yards in the second half. Clearly, without Gonzalez as a target, Ryan and Atlanta’s offense was limited. The Panthers travel to San Francisco next Sunday for a 4:05 p.m. Eastern start against the very dangerous 49ers, playing in Candlestick Park for one last season before moving to their new stadium in Santa Clara, CA. “I thought Cam, even though his stats maybe aren’t as good as the last couple weeks, I was as proud of him today as I’ve been any game,” Gross said. “It wasn’t real pretty. He was getting banged around in the pocket. The run game was kind of slow starting and there wasn’t just long play after long play. We kind of had to hang in there and take our punches.